The original goal of the JMRI project was to produce a library upon which people could use to build their own applications. Although some people do that, more use the existing applications such as DecoderPro and PanelPro. We want to make this more flexible by providing a way to extend those programs without having to rebuild them from scratch. See also the separate pages on adding a new system (i.e. another set of hardware that implements Turnouts, Sensors, clocks, etc) and adding a new type (e.g. something in addition to Turnouts, Sensors, clocks, etc). Scripting JMRI is often the easiest way to extend JMRI, however there are limitations to that which are covered by the other mechanisms. The details of scripting are covered elsewhere. AddButton.py sample script adds a script button to the main window. DisableOpsMode.py shows how how to modify the main window to remove the ops-mode programming button. ReporterFontControl.py sample script is an even more advanced example that changes the appearance of items on panel screens. eventually has CI unit tests, documentation and help pages. In a top level package, i.e. a new java/src/mycooltool directory alongside java/src/jmri and java/src/apps. Your Java files will start with "import mycooltool;" as a package declaration. In a new tools package within the JMRI code structure, i.e. a java/src/jmri/jmrit/cooltool directory with your java files starting with import jmri.jmrit.coolltool;. Next, write the configurexml load and store classes, so that once you've got the objects, you can store and reactivate them. You still need the script (or an XML editor if the info is simple enough) to create them the first time, though, so as a third step write a GUI to create that. That can be invoked by a one-line script at first, and eventually attached to a menu button. Once those first three steps are working and you've created a GUI action class, you can connect that to "Peform action.." and "Add button to main window .." in the Startup pane in Preferences by having it extend apps.startup.StartupActionFactory. A single functional class, SampleFunctionalClass who's only role is to save a sample string. Classes like this would be built out to do the work of your project. A configurexml.SampleFunctionalClassXml class that stores and loads the SampleFunctionalClass object contents to a panel file. A swing.SampleConfigPane class to provide the basis of a cGUI configuration pane. This one just shows a label in it's window, but you can build it out with whatever else is needed. 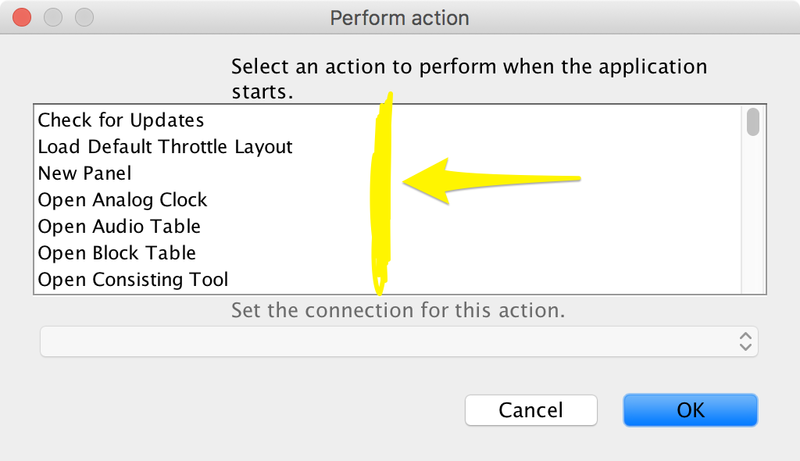 It's connected to the rest of JMRI so that you can access configure connections to it in the Preferences. A complete set of basic test classes. They just check the constructors now, but can be built out as needed. We encourage you to contribute your code to for inclusion in JMRI. That way, lots of people benefit. But if you don't want to do that, you can package it up as a separate .jar file which can just be dropped into the JMRI lib/ directory. By using the approach listed above (and the services listed below), JMRI will automatically pick it up and use it. Sometimes what you want to add provides a very specific technical function. Many of those can be (though historically, perhaps weren't) written as Service Provider classes. When they can be done that way, they should be, because it simplifies their connection to the rest of the code. Java contains a Service Loader that allows classes implementing a specific API to provide a service to a Java application without requiring that the application have prior dependencies defined for that service. Services are provided by creating a JAR for that service and appending it to the JMRI classpath. See Startup Scripts for details on appending a JAR to the classpath and the Service Loader documentation concerning what needs to be in that JAR. Startup Actions can be run at application start or attached to the application's main window as a button. 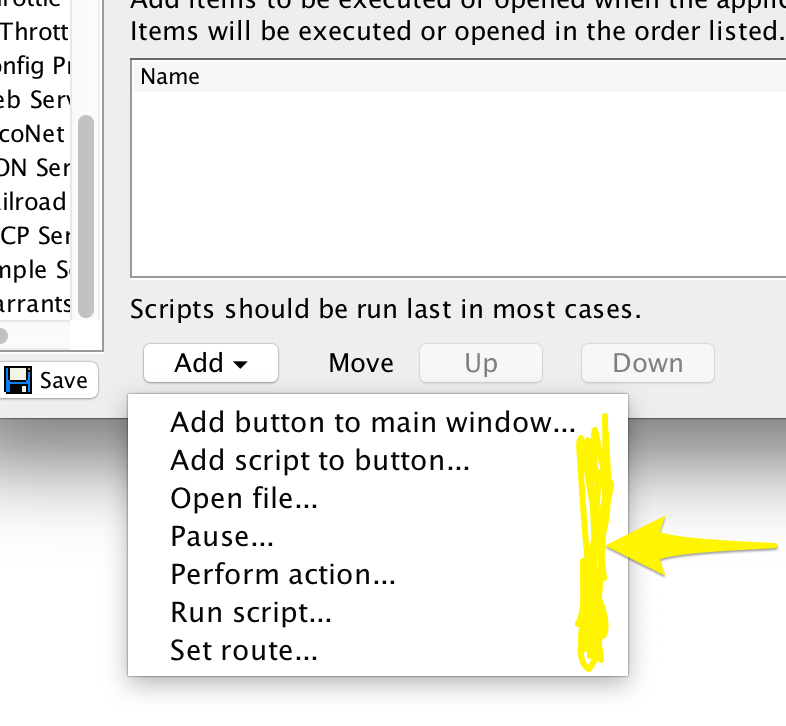 Implementations of this factory class appear as possible selections for the Perform Action.. and Attach Action to Button.. selections in the Add button on the Startup pane in Preferences. One example is the RosterFrameStartupActionFactory class which opens the DecoderPro roster window. They can also expose additional startup actions that can be selected by the user, i.e. to select one of several possible connections to act on. Startup Models provide a mechanism to define optional items to be automatically run during the startup process itself. They can take user-specified arguments. Implementations of this class appear under the "Add" button in the Startup pane of the Preferences. One example is the PerformActionModelFactory class which provides the Perform Action... item. PerformActionModelFactory makes the StartupActionFactory implementations available for the user to select. A PerformActionModelFactory object then remembers that selection, and during JMRI startup invokes that StartupActionFactory item to do that particular thing. Similarly, the CreateButtonModelFactory class will take a user StartupActionFactory selection and attach it to a button at startup, for execution later. Implementations of this factory class provide the hooks so that the Startup preferences can allow a user to set the parameters for a given action. Every manufacturer selectable when creating a configuration is defined by a ConnectionTypeList service. Implement this (and other required classes) to create a new system connection type. See Adding a New System for details. Add new factories for creating default instances of objects managed by the InstanceManager. The JMRI JSON services used in the JMRI web services can be extended using service implementations of this class. See the JsonServiceFactory Javadocs for details. Additional preferences can be displayed in the preferences window by providing an implementation of this class. Add a new preferences manager to JMRI. Preferences managers store, retrieve, and validate preferences within a JMRI configuration profile. If a plugin needs to take action very early in the JMRI application startup sequence, it would need to provide a PreferencesManager service. Provides the Add/Edit pane for a new type of SignalMast. If you define a new type of SignalMast in your code, also define a service class of this type. It will automatically be used to add or edit signals of your new type in the SignalMast Table. See the SignalMastAddPaneProvider class nested within the DccSignalMastAddPane class for an example. Additional servlets in the web server can be added using these mechanisms. Note that the WebServlet annotation needs to provide a name and urlPatterns. Additional file paths, redirections, explicitly blocked paths in the JMRI web server can be specified by providing a service that implements this. The first instance of JmriPlugin will have its start method called while the JMRI application launches. This makes it possible to allow the application's main window and main menu to be extended. Use of this mechanism is limiting because JmriPlugin can only be overridden once. Generally, the mechanisms further up are better.